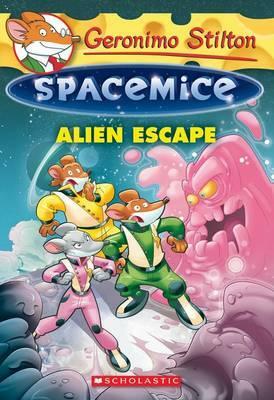 Geronimo Stiltonix is the captain of Mousestar 1, a fabulous spaceship. He is rudely awakened from his dreams to discover said spaceship is about to explode. This is not good news especially when it turns out that the batteries need replacing. Geronimo is thrilled when a group of strange aliens offer to help by giving them access to a rare element. The aliens might not be as friendly as they seem though. Using the same format that makes the various other Stilton series so popular. The story is simple, the text visually interesting and the illustrations fun and colourful. If you’ve taken your kids through the other books then this could be a fun addition to your reading time. If you have kids that are just starting their reading journey and they are interested in space and science fiction, then this could be a good choice for you. Silly fun. 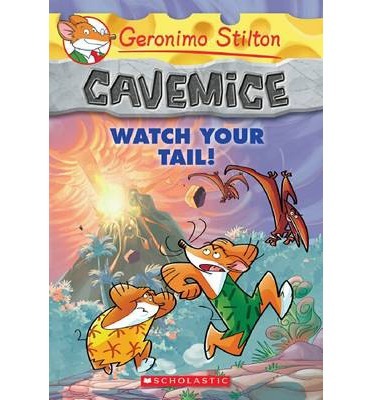 It’s ten years since Geronimo published his first book and Grandfather William wants him to throw a high party to celebrate, and he wants a special book written for just this occasion. Geronimo isn’t so sure about any of this but tries to do what Grandfather William wants. It all goes horribly wrong though when his laptop is stolen and on it is the only copy of his very special book. Geronimo has to go to extraordinary lengths to get his computer and his manuscript back. A fun special hardbound edition. 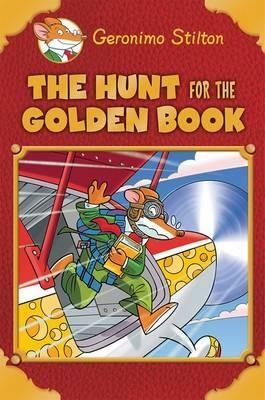 The adventure is fast paced and full of all the silliness that is expected from a Geronimo Stilton book, and many familiar characters whom you love or hate. The format works though so why change it. It remains a good serious for those young ones just starting out on their chapter book reading journey. Ten years is a worthy cause to celebrate. This version also comes with a bonus mini Geronimo adventure. The day isn’t going well, not when everyone in Old Mouse City has a terrible stomachache. The local shaman doesn’t seem to be able to help much and the Club Brothers are making a lot of money of this epidemic. 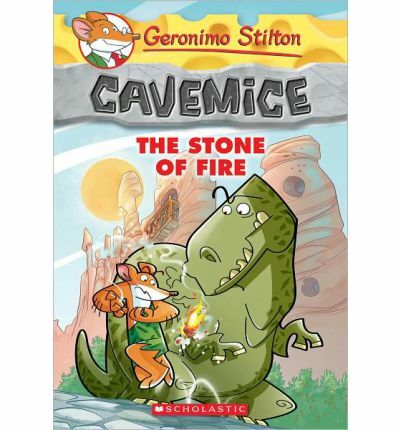 Geronimo is chosen to find the cure because he is one of the few mice who isn’t suffering. Geronimo isn’t too enthusiastic about this as it requires going on a dangerous journey to a mysterious cave. Geronimo will do a lot for a pretty mouse though and the Shaman has a very pretty daughter, not that Geronimo would ever say anything because he is simply too shy. A fun prehistoric adventure wrapped in a mystery. Geronimo would have preferred to go on this one alone, if he really has to go that is, but unfortunately his cousin Trap joins him, which means things get a little more interesting. This spin off series is fun, with perhaps less fact moments than the other ones but when dealing with dinosaurs and a lifestyle very different to our own, it is good to encourage children to imagine. The story, as always is entertaining and the bright coloured illustrations and contoured words make the series continually appealing for those only just beginning their booky journey. A story breaks on the TV news and Geronimo’s grandfather tells him to get out and cover it. Geronimo isn’t too sure about trying to track down a lake monster but it’s part of his job so off he goes. 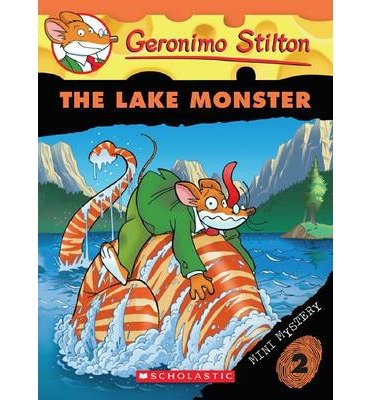 As usual going with his family make things more complicated for Geronimo but that doesn’t make him any less determined to find out what is really going on with this Lake Monster. It turns out there is something of a mystery to be sorted out. This is the second of the mini mystery books and it is a lot of fun. A bit of a play on the Loch Ness monster makes for a good, action filled read. It is what you expect from these books and the smaller format is great for more reluctant readers. I think these books are always fun. A new Superstore has opened in New Mouse City. This is a very big deal and everyone is eager to go, especially Geronimo and his nephew Benjamin. It has a great gimmick, headphones for every shopper. Once inside though something happens that Geronimo can’t explain, he has to dance and buy everything he can get his paws on. He isn’t the only one. Geronimo has a feeling something isn’t right but will he be able to figure out in time just what is going on! 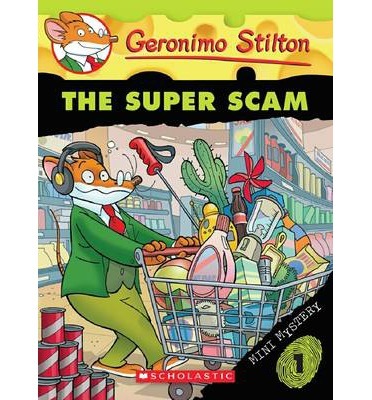 A new series with the ever popular Geronimo Stilton. The story itself is fun and moves at a fast pace. The characters and style of story will be familiar to Geronimo fans. This series is a smaller format than the other books, both in size and page numbers. For those readers who just want something short to practice with, or for those who just struggle to read for any length of time this series is definitely worth looking at.